When I was driving through central Kansas recently on a quick trip to see my sister I tried to keep my eyes open for any interesting photo opportunities that would also not delay me too much. I like to do this sort of thing if I’m ever on a long drive by myself, partly to pass the time but also to explore new opportunities for photos that I don’t get in town. Somewhere on Highway 81 I saw this irrigation sprinkler about a half mile down one of the intersecting dirt roads, so I pulled over, got out, and walked around for a few minutes trying to get a good photo. 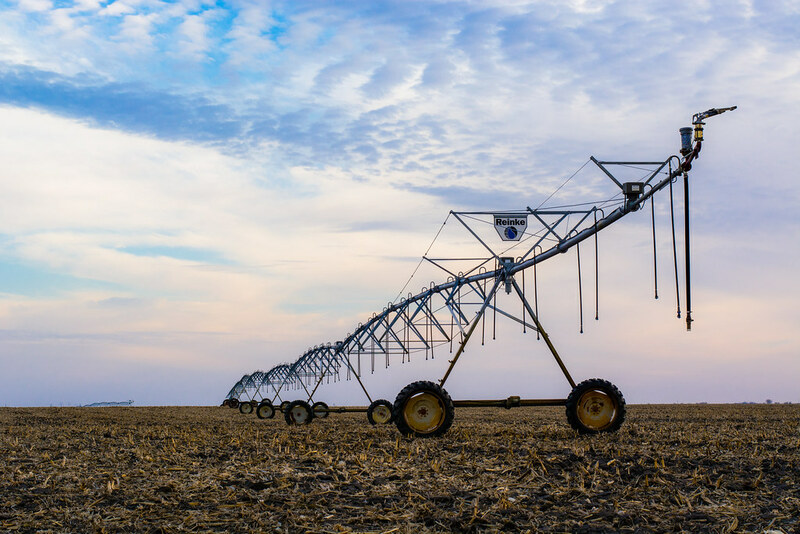 The first thing that came to my mind was a Krayt Dragon, and it seemed like this massive center pivot irrigator would be right at home with its fictional four-legged counterpart from Tatooine. I imagined this huge device lumbering across the landscape, its wheels carving out paths as it watered the plains in a wide circle, and for a fleeting moment this city-dweller was transported to a long time ago in a galaxy far, far away. It was pretty cool. My challenge, then, was how to convey this sense of awe and wonder with a simple 50mm lens? I walked around and tried a few angles, and soon realized that I had to be on the east side or else Highway 81 would show up in the picture–definitely not the feeling I was trying to convey! As such the sprinkler is slightly backlit, but I think the overall effect works quite well. I shot at f/8 using ISO 200 because there was plenty of light to work with, and tried a few different vertical positions as well. I liked this one the best not only because of the way the horizon bisects the picture right along with the axels of the irrigator but because if you look closely in the distance you can see another one peeking out over the prairie. Nicely done! The information you provided on “leading lines” was very helpful. When you took this photograph, were you kneeling down or just that far away from the sprinkler? The photo seems to show you taking the shot from a lower angle. I brought my D5100 to the office today. Hmmm…..what can I get into? Good question, David. I tried a few different positions–kneeling, standing on the ground, and even standing on top of my car. On this particular photo I was kneeling so my camera was a couple feet off the ground, which I think helped lend a sense of scale to the irrigator. It made it seem bigger and more imposing. Nice how you saw these irrigation machines as “Prairie Dragons,” something I can relate to! Rawwwww! The clouds must have been cooperating with you the Wizard of the Rings below!